For new coin collectors it might be hard to decide what to collect. There are so many types of coins, and so many ways to form a collection. I advise my customers to “collect what you like. Do not just collect what others are collecting.” But this is hard advice to follow, many people like to have the reassurance of knowing the coins they collect are popular. Since I began collecting coins in 1998 at age 13 I have collected common coins like Lincoln cents and scarce coins like low mintage three cent nickels. But no other area of numismatics has captured my imagination and held my interest like Civil War tokens. A Civil War token collector must closely examine each piece, and compare their tokens to the pictures in books to find out what type it is. I started collecting CWTs only four years ago. The fact that these are so rare, have such odd designs and have so much history got me hooked. Also, they look different from each other. When I collected U.S. coins I got bored with the sameness of the designs. I also liked the fact that I did not have as much competition to buy the tokens at local shows. Earlier this year I had a chance to tie Civil War tokens to my family history. I discovered while researching the Sheffer line, that my great, great grandparents Henry and Elizabeth (Sherwood) Sheffer were married on October 8, 1864 in Perrysburg, Ohio. As a Civil War token collector I knew there were a large number of token issuing merchants in Ohio during the Civil War. How interesting I thought if Perrysburg had a token issuing merchant! Using my copy of U.S. Civil War Cards, 2nd Edition by George and Melvin Fuld, I discovered that Perrysburg had two merchants that issued tokens with a total of six design and metal varieties. The first was Mr. D. Kreps who sold “Agricultural implements & farm tools”. I do not know what, if any, type of work Henry Sheffer was doing during the Civil War, but I doubt he would have used one of these tokens. The second token however was issued by G. Beach, dealer in “Dry goods, clothing, boots & c”. It is possible and more likely that one of these tokens could have been handled by Henry or Elizabeth. Neither type of token has a date on it, but CWTs were issued in 1863-1864 for the most part, and that fits nicely with the 1864 wedding. Because of this tie-in, these tokens have gone from just six more tokens out of over 10,000 varieties to the top tokens on my want list! The most common of the Perrysburg tokens are Fuld numbers 725A-2a, and 725B-1a, both are Rarity 6 (between 20 and 75 estimated in existence). The rarest of the six are Fuld 725A-1a and 725B-1g, each being Rarity 9 (2-4 estimated in existence). The other two are R-7 and R-8, which means all of these tokens are much rarer than U.S. coinage. The nice thing for collectors of Civil War tokens is that these rare tokens will likely cost $200 or less in EF! The reason being there are far fewer collectors of CWTs than there are of U.S. coinage. 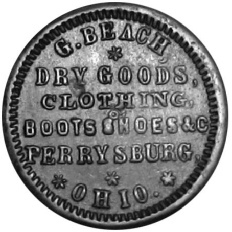 While writing this article, in mid-August, I located a Perrysburg, Ohio, token issued by G. Beach on Steve Hayden’s token website (illustrated). It is the Fuld 725A-2b token. 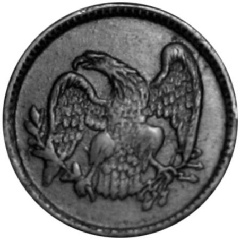 This is an R-8 (5-10 known) token. The coin is graded by Steve as EF (looks close to AU) and cost only $150 delivered! See what I mean? This is a bargain! If you are truly interested in the history of the U.S. Civil War, and want to collect something truly rare, you may like Civil War tokens. But you have to devote the time to research them; otherwise you will quickly lose interest. I say this because so many coin collectors buy coins, but know little about the designer of the coin or why the coin was made. You should collect for the fun of it; you should enjoy looking at the coins or tokens. Happy collecting!